H.R. 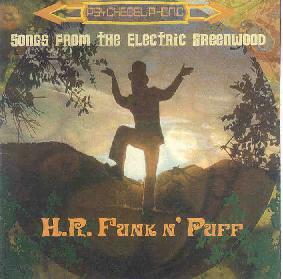 Funk N' Puff - "Songs From The Electric Greenwood"
I’ve been waiting for an album like this. The electronica of the 90’s always had a bit of a psychedelic edge to it, but I always felt it could have moved forward by bringing in instruments other than synthesizers, merging the psychedelic sounds of the 60’s with modern electronic rhythms. Finally, someone has done that, and he goes by the name of H.R. Funk N’ Puff (actually the brainchild of a musician named Moss, along with several friends guesting on various tracks). On Songs From the Electric Greenwood, Moss whips up a tasty and aromatic stew of Chemical Brothers style funky breaks along with the more traditional instruments of psychedelic folk and rock. Things get underway with the murky and spine tingling chant/rap didgeridoo workout of The Incantation. Synaethesia follows, and with its high-pitched Farfisa sounding organ and beautiful harmony vocals it could easily be a lost H. P. Lovecraft song. Holy Roller is summery psychedelic bluegrass, with trippy electronic rhythms and cheerful banjo. Tongue Talk takes the electro-funk approach with Moss’s vocals reminding me a bit of Crispin Mills, making this almost like Kula Shaker does electronica. Very cool stuff. Garden of Summer is a totally spacey, eastern trance freakout, with tabla and trippy lyrics, re-enforcing the summery, nature loving theme of the album. The Shack returns us to the acoustic, banjo pickin’ fun of Holy Roller, and is a joyful partying celebration of all things cosmic and psychedelic. The beautiful and haunting Zoe is a liquidly rhythmic Mellotron drenched trip with a beautiful Donovan-like melody. Liquid Nature Ball follows it nicely, with the distinctly Donovan vocal influence set this time in a weird and wonderful soundscape of bubbling otherworldly forest sounds, eastern drones, playful flutes, and whispery backing vocals. It all ends with a completely psyched out reprise of the first track on the album, appropriately titled Closing the Circle. Oh wait! There’s also a hidden track, an amusing techno parody of subliminal messaging, advertising, and selling out. While it nods its head strongly to artists of the past, Songs From the Electric Greenwood is more than just retro-psychedelia; it’s a trip into the mind of a modern day techno/nature hippie troubadour. And what a deliriously strange and beautiful trip it is! For more information you can visit the H.R. Funk N' Puff web site at: http://www.funknpuff.com. Contact via snail mail c/o Moss; 326 Eagle Ridge St; N.P., CA 91320.